Dentures are a removable option to replace missing teeth and help restore your beautiful smile. If you’ve lost all of your teeth, whether from gum disease, tooth decay or injury, replacing your teeth will not only benefit your appearance, but also your overall health! Dentures can make it easier to eat and speak which will improve your quality of life. When you lose all of your teeth, the facial muscles around your mouth will begin to sag and loose strength. Missing teeth can cause facial collapse and dramatically age a patient. A full denture can help fill out the appearance of your face and profile and help slow down the aging process that was caused by the missing teeth. Your dentist in Merrillville, IN will create custom-fit dentures for your mouth and consult with you on how to properly clean and maintain your dentures. Dentures are often used for replacing your teeth when dental implants are not an option and your natural teeth could not be saved. Dentures are custom-made specifically for each patient. A dental impression is taken of your mouth and is sent to a dental laboratory for your denture to be made. It is common to have a few adjustment appointments and you may need some time before you are completely adapted to your new full denture. Dr. Richter will check your speech and adjust any spots that may be irritating your gums. Some patients require practice eating and speaking before they are comfortable with their new denture. A conventional denture is a full removable denture that is made and placed in your mouth after the teeth have been removed and the surrounding tissues have healed. It may take several weeks or months for the surrounding bone and tissues to heal after the teeth have been removed. An immediate denture is a full removable denture that is made prior to your teeth being removed and placed into your mouth the same day your teeth are extracted. You wont have to be without teeth during the healing process, but you may need to have the denture relined and even remade once the jaw has healed. 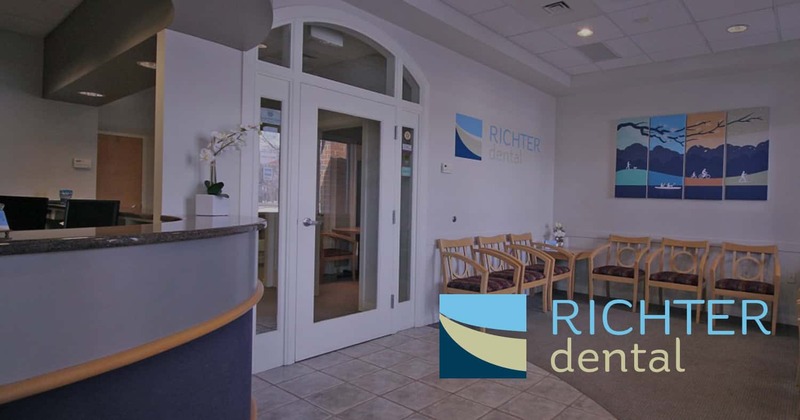 Call Richter Dental today to discuss your teeth replacement options. Throughout your lifetime, your denture will need to be relined, remade, or rebased due to wear that occurs each day. Relining or rebasing is the process of reshaping the denture to make sure it is comfortable and functional for your needs. As you age, your mouth naturally changes and reshapes which may cause your dentures to loosen. Loose dentures may irritate your gums and wiggle when you are chewing. This is why it’s so important to see your dentist in Merrillville, IN for your recommended checkups when you have dentures! See Dr. Richter on your recommended recall to make sure your dentures don’t break, chip, crack, become loose, or cause irritations.